Associate Dean Melvin Rogers of the College of Health and Public Affairs remembers one of UCF's earliest and most ardent advocates for diversity. 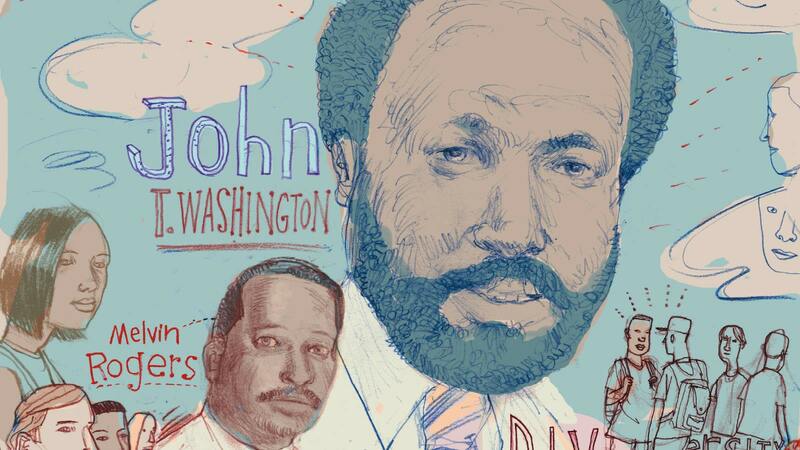 John T. Washington’s legacy is much more than a name on a building. The pioneering associate professor of sociology was one of UCF’s first African-American faculty members, and before he died in 1983 at age 42, Washington left a lasting impact on the many Knights he mentored. I can never forget when I first met John T. Washington. In the summer of 1982, I visited UCF to consider a job opportunity as the student government business manager and was feeling alone because there weren’t many people around who looked like me. Dr. Washington spotted me in front of the library and introduced himself. He made me feel like someone was interested in my well-being on campus. “I’m always here to help you,” he said. “Whatever you need, you let me know.” The encounter played a major part in convincing me to accept the position. I remember him calling me a week later and saying, “How are things going? Let’s have a cup of coffee.” And every couple of weeks he would touch base to make sure I was OK.
As one of the first African-Americans at UCF, Washington truly was a trailblazer. Coming from the University of Nebraska where I was one of only about 100 African-Americans in a student body of more than 30,000, I knew what it was like to feel lonely on a campus and to not have any mentors. He believed that everybody should be welcomed and embraced, and he paved the way for others. To make sure that all students had faculty representation, Washington became one of the first advisers to the Black Student Union. He reached out to everyone, regardless of race, to help build a better university — one that truly believed in diversity among students, faculty and staff. It only takes one person to build a village, to create an environment where everyone is truly part of the family. He made me feel that way. That was Dr. Washington. Dr. Washington was a visionary. He was very strong in his belief that we should have resources for all students to help them be successful, especially those who are new to the university. Part of our role as administrators and professors is to ensure that we are giving every student the tools they need, not just in the classroom, but also in every other aspect of their college experience. And he believed that students should also be helping and teaching each other how to become the leaders of the future. Every time I walk through the Student Union and see students of color, I think about Dr. Washington. If he could look around and see the diversity we have achieved on this campus, he would smile. We do not want what he started to perish. He lived a rich life because he gave so much back to UCF and to the community of Orlando. Today his name lives on, not only with the John T. Washington Center, but also through the deeds of those he inspired.